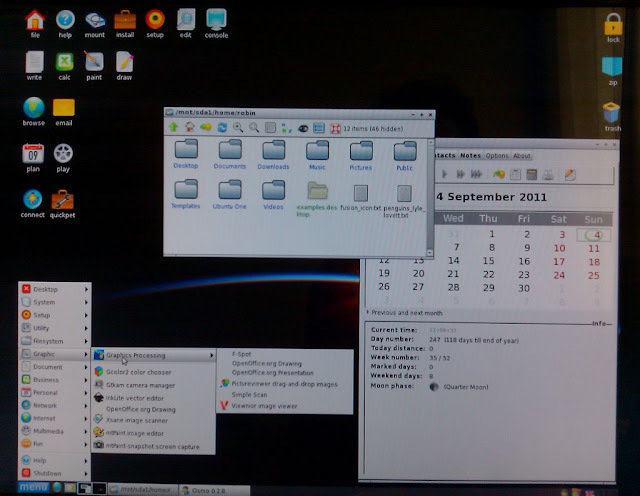 Puppy Linux was designed as one of those small, light-weight Linux distributions, intended primarily for lower specification hardware whilst still providing a full suite of applications and utilities for a usable desktop environment. Puppy Linux 5.2.5 is based primarily on Ubuntu 10.04 LTS “Lucid Lynx,” but there's a mixture of utilities provided using the 'Woof' build system, such as a later version of the e2fsprogs file-system utilities from Ubuntu 11.04 “Natty Narwhal.” Puppy 5.2.5 uses version 2.6.33.2 of the Linux kernel and thanks to that build system, Woof, it can take binaries of other popular distributions and incorporate them into new Puppy releases, among them many components from Ubuntu such as shared libraries and some applications. This may have something to do Puppy rising to no. 9 in the Linux chart on Distrowatch. Compatibility with Ubuntu packages notwithstanding, the spirit of the Puppy remains independent, although I'm slightly concerned that it remains almost a single-handed effort by 'lead' developer Barry Kauler. 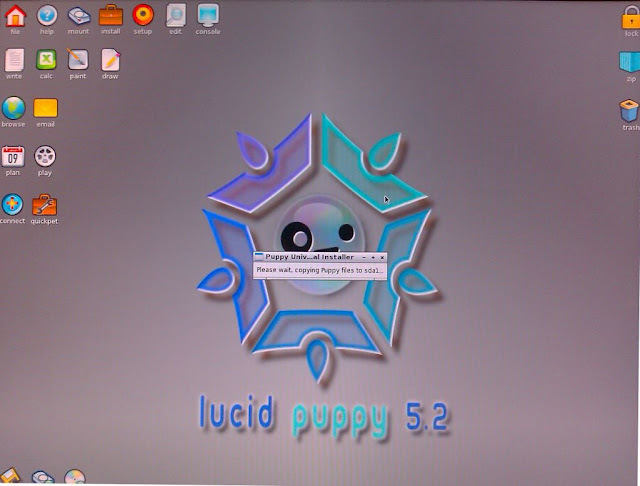 Puppy is bootable from just about any media, including LiveCDs, zip disks, USB drives and hard drives. It does a reasonable job of automatically detecting most hardware. However, I found a problem doing a full install in Virtualbox on a partition formatted ext4. Ext4 is not fully supported in Puppy, as the bug lists show. Puppy's small size makes it a good candidate to install onto USB memory sticks with the ability to save any personalize settings and installed software. At boot-time Puppy loads into RAM, which frees up the boot device for other uses and makes for a very fast system. Puppy’s diminutive size is one of the distribution’s most attractive characteristics, as is the fact that it loads into RAM, making it very fast. On most systems, in fact, boot time is just 30 to 40 seconds, even on my old P-II clone. The pragmatic mish-mash of Puppy's interface and tools helps provide the high performance. Puppy uses JWM and OpenBox with FBPanel, all known for their minimum resource requirements. Many of the tools are console-based or have very simple 1990's style low-res control decks. They are easy to use, but it does feel like a step back in time. Otherwise, Puppy ships with lots of smaller but useful applications for a light-weight but functional desktop. There's the Gnumeric spreadsheet, Osmo personal organizer, HomeBank money management, Abiword and a selection of applications for photo and image management, text editors and media player. Slypheed is the default mail client and Dillo the browser. See what I mean? Step back in time. Using the JWM Windows Manager, the desktop is a riot of colourful Fischer-Price style icons. The standard start-up sound is a friendly bark. More themes are available and more programs are available through the Puppy Package Manager or using the QuickPet alternative package manager. If you don't find what you want in the Lucid Puppy repository, the Ubuntu repositories can be used with one tick-box. QuickPet provides a one-click alternative to install programs such as Firefox, Pidgin and LibreOffice, although the performance of these was tardy to say the least. I haven't persuaded Open Office Writer to run at all on my two test beds. The miracle of Puppy is that it resurrected an old Pentium-II era AMD-based machine with only 256Mb of memory. Desktop performance was good, when the equivalent Ubuntu live CD's for 11.04, 10.10 and 10.04 failed to run, much less install locally. The screenshot is of that machine happily running Puppy, much faster than it ran Windows XP. Where it surprisingly failed is in Virtualbox, where the Puppy Live CD managed to run badly and install to a virtual disk a version which still won't boot despite much remedial work.